Disney gave fans of The Lion King something special to be thankful for on Thanksgiving. The Mouse House debuted the first teaser trailer for the new remake of the beloved animated blockbuster during the Washington Redskins and Dallas Cowboys primetime game, and then immediately dropped the trailer online so fans can watch it over and over again. The minute and a half trailer confirms the 2019 film will stick close to the 1994 award-winning animated movie. 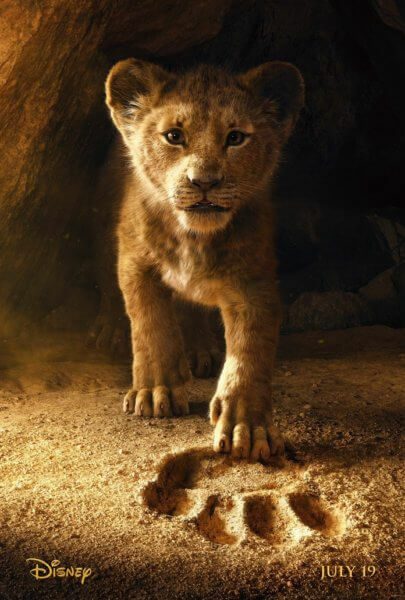 The teaser trailer also revealed the iconic shot of Simba being held aloft by Rafiki on Pride Rock as the animals bow down to the future king will be featured in the remake. The Lion King‘s cast includes Donald Glover (Atlanta, Solo: A Star Wars Story) as Simba and Beyoncé (Dreamgirls) as Simba’s friend and love interest, Nala. James Earl Jones (Rogue One: A Star Wars Story) is Mufasa, Simba’s father. Jones also voiced the role in the 1994 animated film. Chiwetel Ejiofor (Twelve Years a Slave, Doctor Strange) provides the voice of the film’s villain, Scar. Alfre Woodard (Luke Cage) gives voice to Simba’s mother, Sarabi, and JD McCrary (Tyler Perry’s The Paynes) took on the job of voicing Young Simba. Shahadi Wright Joseph (Broadway’s The Lion King) is the voice of Young Nala. The colorful cast of animals who help Simba on his journey include John Kani (Captain America: Civil War) as Rafiki and John Oliver (Last Week Tonight with John Oliver) as Zazu the hornbill. Seth Rogen (Neighbors) is Pumbaa the warthog and Billy Eichner (American Horror Story) portray’s Pumbaa’s best friend, Timon the meerkat. Florence Kasumba (Emerald City) is Shenzi, Eric André (Man Seeking Woman) is Azizi, and Keegan-Michael Key (Friends From College) is Kamari. Jon Favreau, director of Disney’s 2016 blockbuster The Jungle Book, directed the photorealistic animated version of The Lion King. Disney’s The Lion King opens in theaters on July 19, 2019.